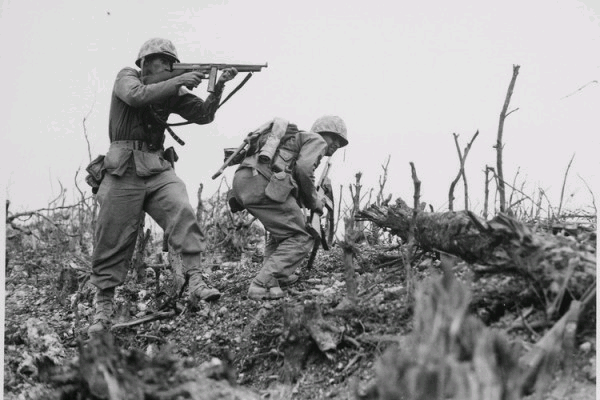 A Marine of the 1st Marine Division draws a bead on a Japanese sniper with his tommy-gun as his companion ducks for cover. The division is working to take Wana Ridge before the town of Shuri. Okinawa, 1945. Marine Corps photo. By Kirk Spitzer, Jan 13, 2012 — TOKYO – More than six decades after U.S. Marines stormed ashore on Okinawa, it may finally be time for them to go home. Japan Prime Minister Yoshihiko Noda on Friday fired his defense minister, in part for missteps and verbal gaffes related to plans for building a new airbase and relocating thousands of U.S. Marines on Okinawa. But soaring costs, local opposition and the changing military environment, as well as budget cuts and force-structure changes at home, are leading some to ask whether the Marines are really needed here at all. “People are going to take a hard look at the Marines and say, ‘Well, I don’t know why they are even there,’” says Jeffrey Hornung, associate professor at the Asia-Pacific Center for Security Studies, a Defense Department-sponsored think tank in Honolulu (Hornung says his views are his own). “Given how much problems this is causing in Okinawa, it’s finally time to re-think things”. . . .
« Unit of Chinese Daily Plans I.P.O.